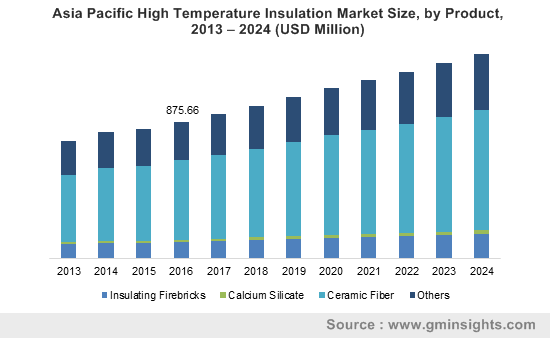 High Temperature Insulation Market Size was valued more than USD 3.0 billion in 2016 and the industry will grow at a CAGR of over 5% up to 2024. High temperature insulation (HTI) products are utilized significantly for temperature intensive applications which help in reducing greenhouse gas emission and heat transfer, hence reduces global warming. These products prevent the heat transfer by reducing the energy required to boost temperatures, which helps in protecting materials from thermal damage. Increasing focus on energy conservation among various industries such as petrochemical, glass, aluminum, and iron & steel, significantly in Asia Pacific, Europe, and North America, is projected to be one of the major driving forces for the global high temperature insulation market. The growth in the region is augmented by rising regulatory pressure on reducing energy consumption and maximizing the energy efficiency of industrial systems. Also, stringent regulation forced on cement, metal, and oil & gas to lower greenhouse gas emissions have augmented the further growth in forecast timeframe. Increasing demand for ceramic fiber for industrial thermal insulation is expected to drive the global high temperature insulation market owing to its properties, which offers insulation by protecting and safeguarding machine’s health & performance, will positively affect the growth of high temperature insulation market over the projected period. Moreover, it offers longer operating life to machinery and ensures energy compliance, which will further enhance growth over the forecast period. The growth is majorly hindered by the presence of carcinogenic content in the insulation materials which pose a high risk to human health. Thus, several countries across the globe have laid stringent regulations to guide the production process, which will negatively impact the market growth over the coming years. High Temperature Insulation Market, By Product. Ceramic fibers are majorly used for production segment with a market value over USD 1.7 billion in 2016, due it has a wide range of application in varied end-use industries. These fibers have a low thermal conductivity, which helps them to become remarkable energy-saving materials. Further, it has low thermal inertia and low density, which helps in controlling the temperature present inside the insulating surface. These characteristics, along with its wide range of operating temperatures, have increased the application of ceramic fibers over other products in several industries. Calcium silicate is the fastest growing segment with a CAGR of over 5.9% over the forecast period. Increasing industrialization in developing regions and government regulations are favoring the growth of high temperature insulation market, will augment the growth of calcium silicate in the forecast timespan. The demand for insulation on industrial grade piping and equipment is increasing across most of the developing economies. In the countries such as China, and India, the manufacturing sector is one a fast growth path, creating a significant demand for calcium silicate insulation products in these countries. Increasing petroleum drilling activities globally are also giving an additional boost to the growth of high temperature insulation market. The petrochemical is the most significant end user segment regarding both volume and revenue. This segment will cross USD 500 million in 2016. Rise in the petrochemical activities, and expected growth in this industry is attributed to the growth of this market. Moreover, the growing demand for petrochemical products for wide range of applications is further giving a significant boost to the growth of this high temperature insulation market. Thus, to address the increasing demand for these products, the producers had enhanced their production capacities which have led to the development of new manufacturing units that use high temperature insulation materials, owing to the growing concerns associated with energy savings and greenhouse gas emissions. Moreover, the ceramic industry is the fastest growing segment with a CAGR of over 5.5% over the forecast timeframe. 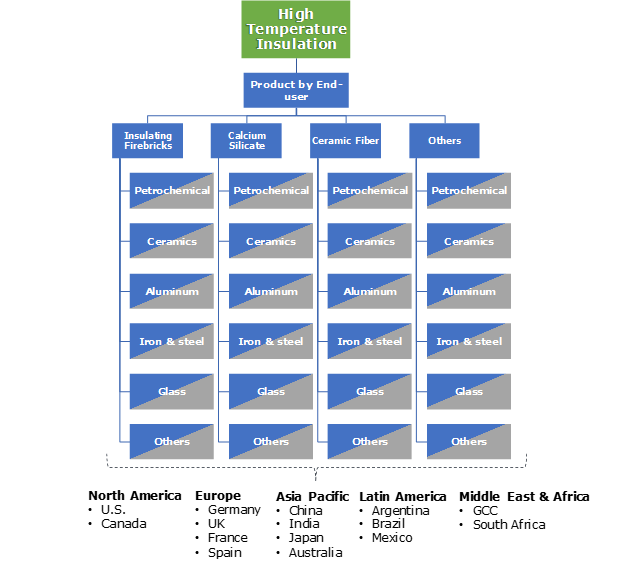 Asia Pacific is the dominant region regarding high temperature insulation market volume, which is primarily led by China and India. The regional growth was mainly driven by the increase in the industrial sector and the increasing consumption of high temperature insulation materials in emerging economies. Moreover, the market is expected to rise in countries, such as Australia, Japan, and others, over the forecast period due to increasing concern related to the optimized use of energy among the government bodies. North America high temperature insulation market is exhibiting a significant growth across the globe over the forecast timeframe owing to innovation and investments in research and development of better products with the support of technology from the U.S. and Canada. Moreover, the increasing demand for high insulation product is due to stringent government regulation emphasizing on efficient of energy, which will positively grow the market over the forecast period. The global high temperature insulation market share was highly competing in 2016. Significant companies contributing to the global market include Hi-Temp Insulation Inc, 3M, BASF SE, and Cabot Corporation among others. Key players in this market are heavily investing in R&D, and production facilities to expand their geographical reach and attain a significant position in the business. Furthermore, key players follow innovations to offers better product in terms of performance, quality, and appearance, etc., to strengthen their market position. The high temperature insulation market is strongly driven by its extensive use for protecting and safeguarding machineries and equipment. Increasing use of this material in energy conservation systems will drive the high temperature insulation market over the coming years. Morgan Thermal Ceramics Plc is one of the key players in this market. The company focuses more on developing innovative products made up of insulation materials. Unifrax LLC is another company, which has established a solid position in the high temperature insulation materials market. This company invests more on mergers & acquisitions, and as well as new product developments to develop new technologies, and innovative products.